Posted July 2nd, 2012 by Ange & filed under Uncategorized. 10. Any of the working men’s clubs (loads in Blackpool) … The Duple & The Number One Club are both nearby & have regular entertainment, bingo, raffles etc as well as welcoming children. If you’re not a member just pop a donation into the box. Posted June 22nd, 2012 by Ange & filed under Uncategorized. 6. The Illuminations – starting the first Friday in September & ending on Sunday 10th November in 2013, the Lights provide the greatest free show on Earth! Look out for the illuminated trams … the rocket, gunship & Fisherman’s Friend! 7. The World Championship Fireworks displays … Fridays in September … countries compete to see who can provide the best firework display & we all win! 11. Stroll around the newly-refurbished Winter Gardens … the architecture is magnificent & the art-deco Mazzei Cafe inside is a haven of tranquility. I know that’s 11 things … ah well! Posted June 9th, 2012 by Ange & filed under Uncategorized. 1. Tower circus … pass 2 hours (with or without kids!) watching incredibly talented performers in this iconic building. At around £10 per adult it’s a brilliant show! 2. Sandcastle Indoor Waterpark … get wet indoors in tropical heat with a choice of slides & attractions to keep even the biggest kids amused. Ride the roof-top slides if you dare! 3. Madame Tussauds Waxworks … upgraded with new “entertainment” & “variety”-themed models; take your camera along & have a picture taken with Cheryl Cole, Alan Carr, Susan Boyle, The Queen or your favourite performer. 4. The Arena … ice skating anyone? 7. Coral Island … the biggest amusement arcade on the Prom with slots, grab machines & rides for the kids; hope you saved plenty of 2p’s! 11. The Tower Dungeons … a brilliant interactive attraction (real actors), akin to the Horrible Histories which kids love. A drop ride ends the experience or you can choose not to take this if you prefer. 12. Catch a show in the evening … choose from The Grand Theatre, The Opera House, North Pier, Central Pier & the Pleasure Beach; there’s bound to be something for you!! If not, try the live entertainment in the many bars & clubs. The cabaret at the Talk of the Coast at the end of our street is both free & excellent! (Yes, I know that’s 12 … but there are so many things to choose from & I could go on). Hope I’ve inspired you! Posted May 18th, 2012 by Ange & filed under Uncategorized. Took my grandchildren to Blackpool Zoo this week & it really IS the perfect family day out! There has been huge investment over the last few years with new enclosures replacing old, out-of-date ones (for example, the sealion area), new animals (such as a new pride of lions), the introduction of completely new animals such as the giraffes & penguins with state-of-the-art, purpose built enclosures (wolves coming this year) & fabulous “up close & personal” areas … my grandchildren LOVED these! Lemur Wood was their favourite as the lemurs were sitting sunbathing on the path, enjoying all of the attention they were getting from the visitors. They also loved Amazonia (a recreation of a tropical rainforest) with tiny monkeys & parrots running & flying free; watch your bags as the monkeys are very adept at locating food! But it’s just lovely being able to get so close to the animals. There is a play area for the kids & a cafe for when you need to get a second wind & if the kids STILL have spare energy at the end, there is a price reduction for zoo visitors for Playbarn entry. Can’t be beaten for a family day out! Posted April 2nd, 2012 by Ange & filed under Uncategorized. 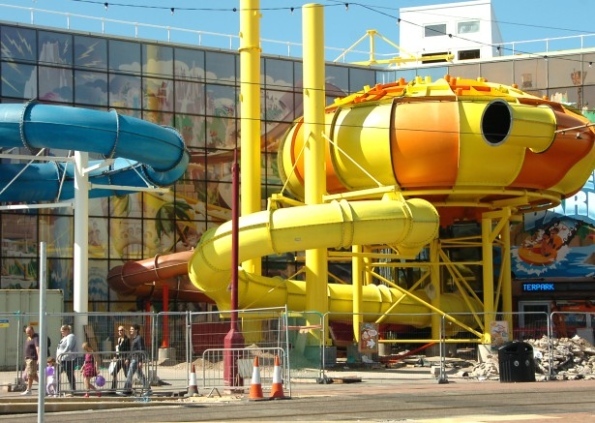 Montezooma & Aztec Falls are 2 new slides for 2012 at the Sandcastle, Blackpool; you can’t fail to spot them even before you enter the building as both slides come off the roof of the building, run part of their courses outside (above the prom) & re-enter the building for a final splash. Both are fast & furious rides, one in the dark, with various spins & turns, one with a “bowl”, too, which you spin around before eventually dropping out for the rest of the ride. Add to these 2 new slides the Master Blaster & Side Winder & the Hyperzone is really the place to get the adrenalin flowing! Senior’s … for the best fish & chips in Blackpool … indeed, in the whole of the UK! Posted March 28th, 2012 by Ange & filed under Uncategorized. Many of our guests ask us the best place to buy fish & chips when they come to Blackpool & we always recommend Senior’s, which was recently crowned Britain’s best fish & chip shop. There are 3 branches on the Fylde Coast … one in Thornton (near Marsh Mill), one in Normoss (near the Blackpool Victoria hospital) & one in Lytham St Annes High Street. They serve a wide range of fish, John Dory being their speciality, the chips are crisp on the outside & fluffy in the middle & the mushy peas taste the way mamma used to make! The premises are modern & clean & the staff well-trained… well worth a visit! Posted March 24th, 2012 by Ange & filed under Uncategorized. For those of you who love splendid architecture, fabulous features or a bit of history, the Winter Gardens, Blackpool is a real hidden gem. Much of the building has been symapthetically restored to its former 1870’s glory & the new Heritage Tours take you into rooms & areas which visitors would not normally get to see. For example, you can stand on the stage of the Opera House where people like Morecambe & Wise & Elton John have performed & which has played host to two Royal Variety Performances infront of Her Majesty Queen Elizabeth. 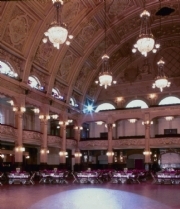 Then there’s the magnificent Empress Ballroom, renowned not only for its sprung dance floor but for its excellent acoustics & where heads of state like Margaret Thatcher & Winston Churchill have addressed the party faithful & where bands such as the Rolling Stones & White Stripe have performed. Nearby is the Empress Grill (a division of Heathcotes), serving the needs of theatre goers & diners at weekends & this has been restored in art-deco style. Opposite, in what was more-recently an amusement arcade, is a splendid art-deco cafe area, the modern panelling having been removed to reveal the original features & friezes in perfect condition. Further along the Floral Hall sits a bar which is decorated in the style of a Spanish galleon, perfect for pre-show or interval drinks & upstairs are the Spanish Halls, used for private functions & dance events. There will be one scheduled tour per month but others may be booked subject to numbers. Just £5 per tour … amazing value for money & well-worth 90 minutes of your time! Posted March 4th, 2011 by Ange & filed under Blackpool Makeover. It has taken a long time (& even more money) but Blackpool Prom is looking magnificent! Gone is the straight beach, replaced with sweeping curves & headlands which will house new attractions. Steps down to the beach along the whole length of the Prom have created new seating areas with excellent views of the sea & events such as the Airshow & the World Fireworks Championships. Bikes are available for hire & can be returned to other stations around the resort. The Tower Headland is the last to be finished & will be open by July; this houses a wedding chapel overlooking the sea & the “comedy carpet” … a hollywood-style tribute to famous comedians … with their catch-phrases captured in granite. If you’ve not seen it yet, it is well-worth the journey. Posted December 17th, 2010 by Ange & filed under Blackpool Makeover. Posted November 29th, 2010 by Ange & filed under Blackpool Makeover. The area around St John’s Square has been pedestrianised & cobbled & the eateries there are able to make use of the space for al fresco dining. Birley Street has been transformed into a Freemont Street (Las Vegas)- style attraction with huge Loch Ness Monster-style arches bathng the area in soft lighting & music. This pedestrianised street is full of cafes & more al fresco dining. The Houndhill Centre is Blackpool’s under-cover shopping mall with national chains such as Primark, Next, Deichmann, Clarks, New Look, Jane Norman, La Senza & the flagship development, Debenhams. There are plenty of places to eat & drink here or even just to sit & people watch.